The Microsoft Technical Associate (MTA) programmes are entry-level training and certification in the fundamentals of IT Infrastructure, Database and Software Development, designed by Microsoft, with the MTA Networking Fundamentals programme focusing on the IT Infrastructure track. By completing this programme and passing the associated online exam, it can be used as a stepping stone to the Microsoft Certified Technology Specialist (MCTS) exams. The purpose of the MTA Networking Fundamentals programme is to provide an overview to candidates on the essentials of networking principles. Being a Microsoft exam you will be learning the foundations of Windows Server and any potential candidates are expected to have hands-on experience with networking management tools, DNS, TCP/IP, and an understanding of the names resolution process and network protocols and topologies. for this programme could be looking to enhance their knowledge and understanding in networking, or could already be in a support role and looking for career progression. This objective may include but is not limited to: VPN, security zones, firewalls. This objective may include but is not limited to: perimeter networks; addressing; reserved address ranges for local use (including local loopback IP), VLANs; wired LAN and wireless LAN. This objective may include but is not limited to: leased lines, dial-up, ISDN, VPN, T1, T3, E1, E3, DSL, and cable and their characteristics (speed, availability). This objective may include but is not limited to: types of wireless networking standards and their characteristics (802.11A, B, G, N including different GHz ranges), types of network security (for example, WPA/WEP/802.1X), point-to-point (P2P) wireless, wireless bridging. 1.5. Understand network topologies and access methods. This objective may include but is not limited to: star, mesh, and ring. This objective may include but is not limited to: transmission speed; number and type of ports; number of uplinks; speed of uplinks; managed or unmanaged switches; VLAN capabilities; Layer 2 and Layer 3 switches, security options; hardware redundancy; support; backplane speed; switching types, MAC table; understanding capabilities of hubs vs. switches. This objective may include but is not limited to: transmission speed considerations, directly connected routes, static routing, dynamic routing (routing protocols), default routes; routing table and how it selects best routes; routing table memory, NAT, software routing in Windows Server. This objective may include but is not limited to: cable types and their characteristics, including media segment length and speed; fibre optic; twisted pair shielded or nonshielded; cabling, wireless; susceptibility to external interference (for example, machinery, power cables); susceptibility to electricity (for example, lightning), susceptibility to interception. This objective may include but is not limited to: OSI model; TCP model; examples of devices, protocols, and applications and which OSI/TCP layer they belong to; TCP and UDP; well-known ports for most-used purposes (not necessarily Internet); packets and frames. This objective may include but is not limited to: addressing, subnetting; NAT, static IP, gateway; APIPA; network classes, classful/classless IP addressing; reserved address ranges for local use (including local loopback IP). This objective may include but is not limited to: tools such as ping; tracert; pathping; Telnet; IPconfig; netstat, reserved address ranges for local use (including local loopback IP); protocols. Below are some examples of the types of multi-choice questions you may be asked to the exam. Q2. Which layer of the OSI Model do bridges work on? Q3. You would like clients in one subnet to receive IP addresses from a DHCP server in a different subnet. What feature would the interconnecting router need to support? This programme can be embedded into any IT curriculum starting from Level 2 provision, with particular links to the IT Professional certification track. Delivery styles will vary, but it is recommended that students really embrace the MTA curriculum and training providers use a good blend of hands-on resources and plenty of intense revision sessions. Typical delivery time is between 3-6 days, including exam. As this is a Microsoft programme learners and training providers often find the MTA programmes are fun to teach and students who have a passion for Networking will fully benefit from its course content. If you are just starting your career in IT and have developed a keen interest in the Infrastructure track, then there is no better place to start building up your professional vendor portfolio than with the MTA Networking Fundamentals exam. 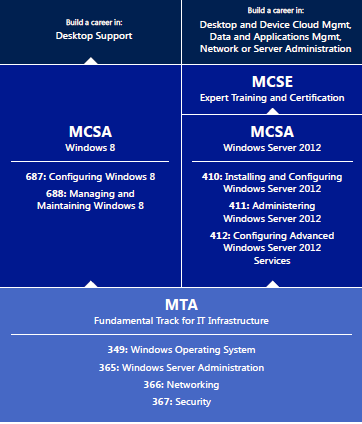 As you can see from the certification path below the MTAs provide an excellent foundation to your future in IT. Other related MTA exams are 98-349 Windows Operating System Fundamentals; 98-365 Windows Server Administration Fundamentals and 98-367 Security Fundamentals. 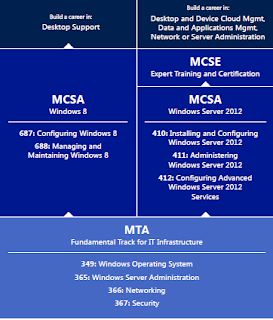 Microsoft Certification on your CV! Considering attaining your MTA Certification? Firebrand are one of the few IT Training companies in the UK who off the the full range of MTA certifications. To find out more about the courses offered, check the links below. This article was written by Adrian Davies, Apprenticeship Development Manager at Firebrand Training. Adrian has been in the IT Training industry since 2001 and prior to Firebrand was the Curriculum Manager for Pearson PLC.